Greetings from One Week in Rome! You should, as there is a lot to explore. We are excited to share with you our best insider tips to spend One Week in Rome. We introduce you to all the information about Rome and the unique experiences that the city offers. It is one of the most popular spots in Europe and world wide. Known for its pizza, and pasta. There is also a must do thing while in Rome: taste their coffee. There is no place in the world with more options about ordering a coffee. Have a look at the video below and when in Rome, find your favorite way to taste your Italian coffee. Rome can seem overwhelming at the first sight, but fear not. With all our information you will be able to spend one marvelous week in the Eternal city. If you still have doubts after this article, we love WikiTravel, and especially their district section is a great starting point to get to know a city. The introduction guide to Rome by Lonely Planet is a fab resource to get a good insight on sights to visit, and what to consider. Whether you are staying only one day, or seven, Rick Steve gives you a deep introduction on what’s the fuzz about in Rome. If you want to live and experience Rome at the fullest, we recommend staying near to Piazza Spagna. This is the most central and convenient location to all important monuments and sights. If you stay in the city center, you will be able to go by walk to almost all the main sights. You will find all the main sights in rome below, put on a map. 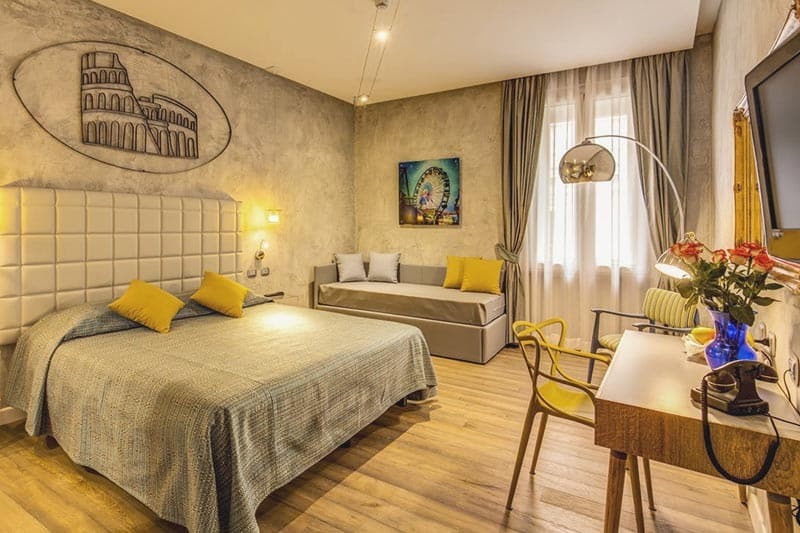 Staying at the city center is a bit more expensive, but it will save you time when getting to see the main sights and will let you live the city at its fullest. The most popular areas when staying in Rome are the city center and Termini. Termini would be an option only for the lowest budget travelers, as it s not a really nice area. Termini is also an area for the party lovers, as it is the place where almost all night buses stop. Trastever is a very nice neighbourhood to visit and live, as it is the place where many families live. The Vatican is also an area with plenty of accomodations. These areas are not central. You will need more time to arrive to many sights. If you are not planning to see many things around these two zones, book your accomodation in the city center. You will find all areas on the map below with all the neighbourhoods. We modified the neigborhood areas adding only the interesting areas when visiting Rome (not the real neigborhood limitations). Here you have also our personal recommendations for the different travelers. 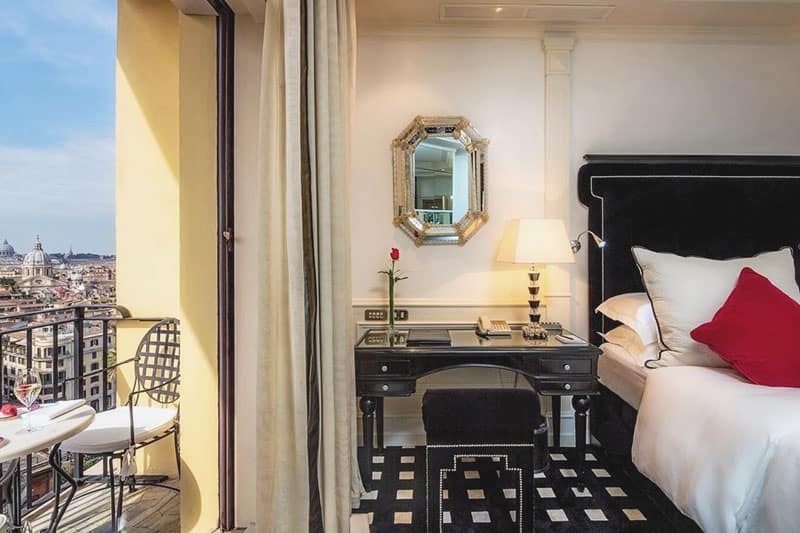 For those seeking the luxury in the Eternal city, there is no better option that Hassler Hotel. Just on top of Piazza di Spagna, you will be deligthed by the room views, the terrace and the nice restaurant that it offers. Nice and cozy hotel in the center of the city, Parlamento hotel is a real Rome traditional hotel with nice staff. Bear in mind the hotel is located at the fourth and fifth floor of a building. 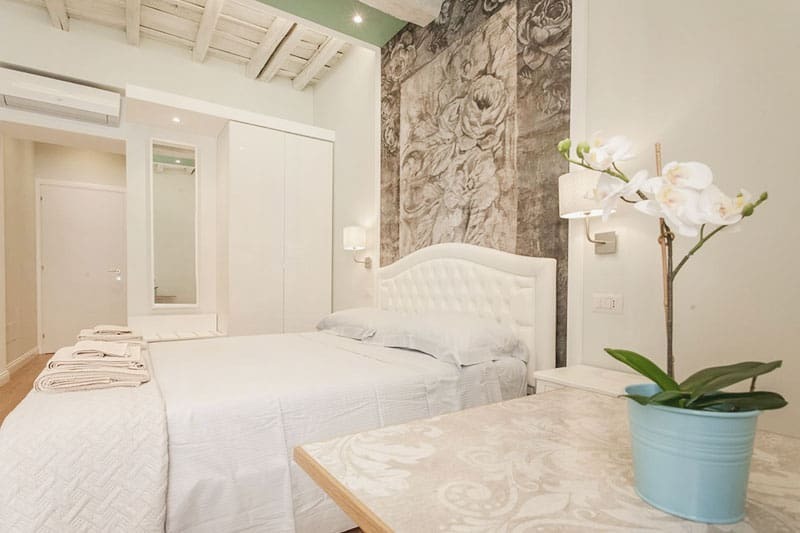 Romantic facilities and directly at Piazza Navona. 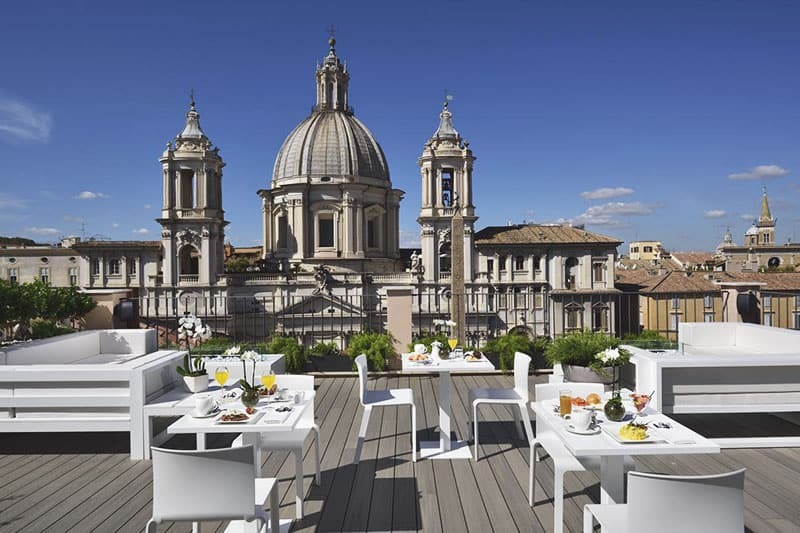 Enjoy breakfast in the room or at the hotel terace with views to Piazza Navona. A phantastic place which will be difficult to leave. Fortunately is nearby many attractions. Boschetto 124 is an excellent apartment for a family stay or two couples. Beautifully decorated and homely, it is only 600 meters to Coliseum. 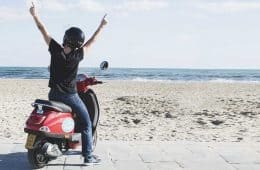 Find the 3 best hostels in Rome, all compared by location and facilities. Roma, lovely (Amor = Love), Roma! We are currently working on our itinerary for 7 days. You cannot leave Rome without eating properly. Here is an overview of cool articles related to food, and eat-outs in the Italian capital. Wanna eat like a local? The vogue discovered 5 Roman restaurants only locals know. 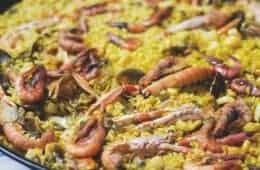 If you are hungry right now, do NOT click on this link here. Do you want to eat more on a budget? Here is an ultimate list of cheap restaurants. Are you a night owl? Here is some handy info on 9 night things to do. Staying on a tight budget? National Geographic found a big list on free things to do in Rome. Find all the activities in Rome here. There are plenty of things to see in Rome, no surprise, right?! But fear not, many attractions are very close to each other. Many sights require a ticket. I recommend getting your ticket as soon as possible, since some of them can be sold out easily. Below you find a list of the tickets you should purchase as soon as you have your travel dates fix. One of the best parts about visiting Rome is their food. What about joining a Food and Wine tour? That way, you will meet other like-minded travelers. Also, you should try an aperitivo. The Italian apperitivo happens around 6-8 PM and it consists in having a drink and getting free food. One of the best in the city is on this Rome Secret Guide. Here you have all attractions put on a map. All the different neighbourhoods are also marked. This way, it will be easier for you to look for your perfect accomodation. 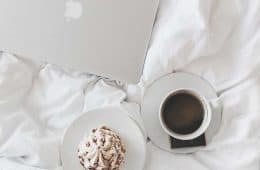 If you are looking for personalized recommendations, check out where to stay in Rome or send us an email. For Piazza di Spagna and Trevi fountain you won’t need any ticket, but I do totally recommend you to go early in the morning, before the crowds get there. That way you will avoid getting a selfie stick too near your face. A week in Rome is quite a lot of time. If you want to get away from the husstle of the city, here you have some day trips ideas. In less than 2 hours train you will be able to get to Napoli. For many people, Napoli is the real Italy. One thing is sure. The best pizza is there, (and it is incredibly cheap). Ever heard of Pompeii? It is one of the vast archeological sites in Rome. Declared an UNESO Site, it is the place where you can see how life in ancient Rome was like. A bit further away but worth to visit, the cities of Florence and Venice pop in my mind. Ever been to such a romantic city like Venice? Belive me, you won’t forget it . If you are not planning to go back to Italy in a while, take your chance and visit Florence or Venice. I know I know, we all dream about a house in the Tuscany after the film Under the Tuscany sun. What about visiting the Tuscany to see that wonderful place with your own eyes? We’d be happy to help. Drop us a line via email. Last but not least, here are all our articles about the Eternal city. Here we collected plenty of useful information for your trip to Rome. 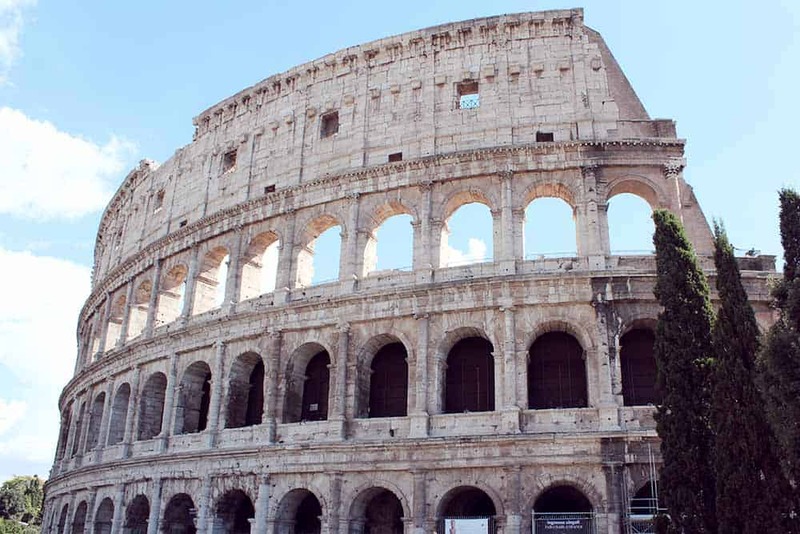 From the very Rome 101, to things to do, restaurants, and more. Just dig and get into the details. We always keep this guide updated, and we’ll add more interesting links whenever we come across new information we liked.